The direct descendant of the 1960's televised torture test survivors, today's Easy Reader is as durable as it is classically cool. Featuring a stainless steel expansion band, full Arabic dial, date window, 30 metre water resistance and INDIGLO night-light. 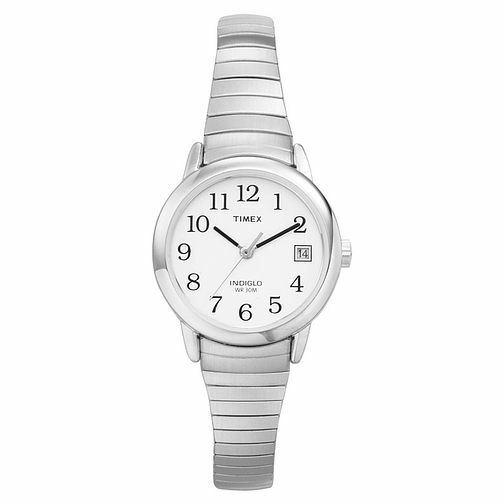 Timex Ladies' Easy Reader Stainless Steel Bracelet Watch is rated 5.0 out of 5 by 2. Rated 5 out of 5 by Anonymous from Nice watch Good watch and good service. Nice box and gift wrap. Rated 5 out of 5 by Anonymous from The perfect gift! Was looking for a Valentines gift for my wife. Couldn't really find anything suitable in store. The sales assistant helped me look through the many other products on their website. Found the perfect product there, ordered it, then received an email when it was ready to collect from the store, so I could keep it a secret!